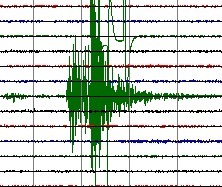 Light earthquake at a safe depth. Divergent boundary earthquake (plates are moving away from one another) in the middle of the ocean, creating an undersea mountain chain in the deep ocean. The same epicenter area than the 07:33 earthquake. Aftershock of an earlier more powerful earthquake a couple of weaks ago. Umak and Adak island.